4-Ingredient Veg Breakfast Recipes to Get, Set and Go! Nobody can deny the fact that breakfast is the most important meal of the day. After a full night’s ‘fast’, the body requires ample nutrition to dive headlong into the busy day ahead. Yet, most of us make the mistake of walking out on an empty stomach or with an insufficient breakfast like just a banana or a glass of milk. No, it’s not about being on a diet, it’s all about time. Most people skip breakfast or have a skimpy meal because they do not have time to prepare and cook an elaborate spread. Not to worry, this amazing collection of 4 Ingredient Indian recipes will help you out of this dilemma. We have presented here an assortment of easy and quick 4-ingredient breakfast recipes that is sure to pique your interest. You will be amazed by how four main ingredients can give rise to a sumptuous and tasty meal. Most of these ingredients are commonly available ones, and of course, the additional ingredients like oil and seasonings are sure to be available in your kitchen shelves. Making a dish with minimal ingredients is quite beneficial for the busy-bee, because it means you do not have to go on a wild goose chase purchasing a long list of ingredients, and also the pre-cooking preparations will be over in a jiffy. These breakfasts are also super tasty and some very nutritious. You can top up on the goodness of millets with the Jowar Pyaz Ki Roti or Mini Jowar Pancakes, or catch some protein from the satiating Paneer Paratha. Fibre-rich Oats Upma and iron-rich Poha Dhokla will surely make it to your favourites list, while traditional options like Masala Puris Served with Curds and Chunda remain at the top of the charts. South Indian breakfasts like Quick Rice Dosa, Onion Tomato Uttapam and Quick Vegetable Appe are also well-balanced breakfasts that you can prepare with few ingredients like rice and urad. For those who love to start their day with breads, the Three Layered Cheese Grilled Sandwich is an awesome choice. Have a look at these and more such recipes on our website and app. Plan for breakfast the previous day itself so that you can comfortably prepare the required batters or masalas in advance when you find time, and keep only the cooking job to be done in the busy morning hours. These amazing recipes will ensure that you have a sumptuous breakfast regularly, thereby paving the way to good health. Happy Cooking! Enjoy our quick four ingredient breakfast recipes. 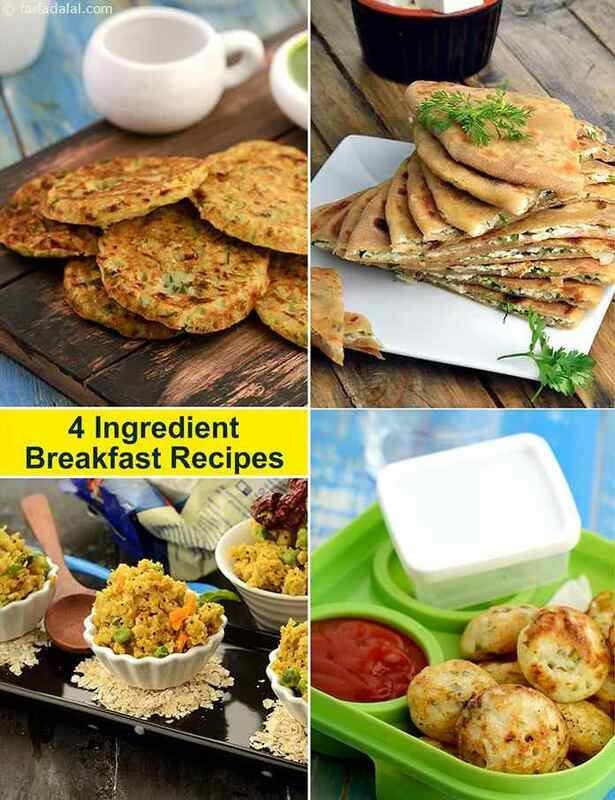 quick Indian four ingredietnt breakfast recipes and other quick recipe articles below.